Wednesday May 14th 1884 As soon as I got the work done up I went over to Hatts and spent the day. Rob came down there from the office for his dinner. I worked on her shawl. Thursday May 15th 1884. We had the washing done this morning and I got part of the ironing done in the afternoon. Aunty Walker was here for dinner. Mother went to town I was very tired at night and went to bed early. Friday May 16th 1884. Rob took May and I to the valley today I stayed at Aunt Ellens till nearly supper time and then went over to Grand-mas to stay all night. I was working on Hatts shawl. Rob went home as soon as he ate his dinner. 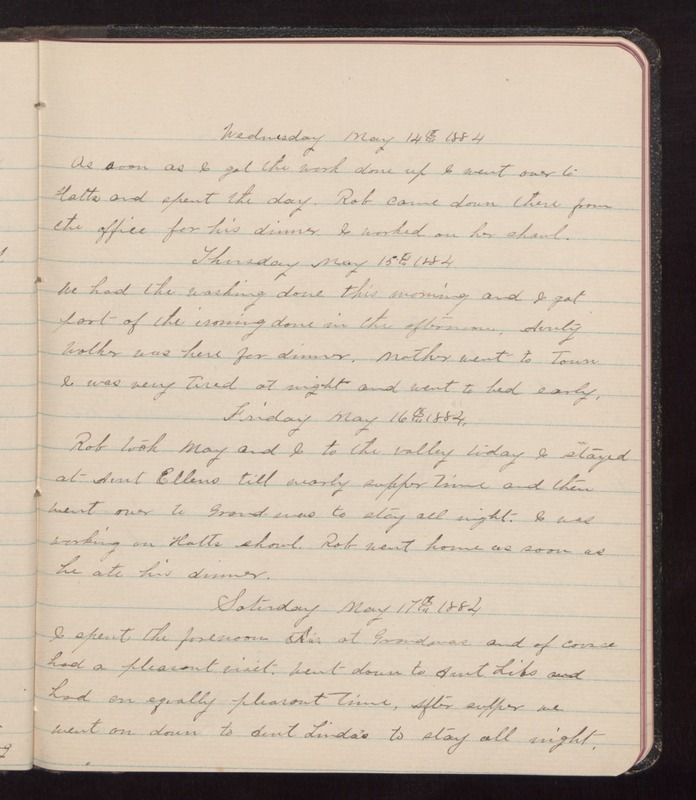 Saturday May 17th 1884 I spent the forenoon at Grand-mas and of course had a pleasant visit. Went down to Aunt Libs and had an equally pleasant time. After supper we went on down to Aunt Linda's to stay all night.